Whey Low® is the brand new product of a nutrition technology that has only recently been developed in VivaLac® Inc.'s laboratory and clinic. VivaLac® Inc. has obtained a US patent (#6,777,397) to protect its exclusive use of this technology. In the clinic, the Company has conducted about eighty oral tolerance tests (OTT's) of Whey Low® and controls with nine different subjects in order to support its claims for the new sweetener. The following technical description of several of the studies performed to date should provide some answers to questions you may have about the efficacy of Whey Low® and how it works to provide reduced calories and lower postprandial blood sugar. Figure 1 shows the comparison for delta plasma glucose concentration over time after ingesting sucrose (50 g total carbohydrate in 200 g water) or Whey Low® (50 g total carbohydrate in 200 g water) by a normal subject. Utilization of the student's t test shows statistically lower delta plasma glucose levels vs. sucrose in the subject ingesting Whey Low® at 30 (68% reduction), 45 (61% reduction), 60 (91% reduction), and 120 minutes (250% reduction) after dosing. 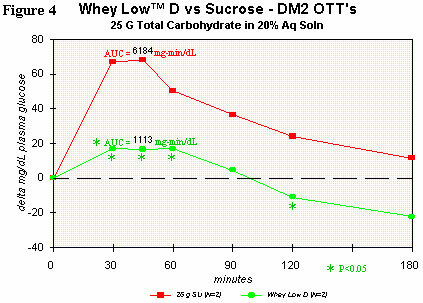 The area under the curve (AUC) for Whey Low® was significantly lower by 80% vs. sucrose. AUC is the time-weighted measure of delta plasma glucose level that correlates in the short term (3 hours) with caloric value and, in the long term (a month and beyond), with the consequences from hyperglycemia, such as renal failure, loss of sight, amputation of limbs, etc. No gastrointestinal effects were observed. We know the theoretical value of AUC for Whey Low® from control studies with the subject and literature glycemic index values for the component sugars and can calculate an estimated caloric value (ECV) of 1.9 kcal/g (or 1.9 Calories/gram) for Whey Low®. In effect, two of the common caloric sugars in Whey Low® are interfering with the normal absorption of others in the small intestine. The result is that most of the sugars are passing into the colon where they are completely degraded by the normal microflora into (1) additional biomass, which is eliminated in the feces and has no caloric value to the host, or into (2) short chain fatty acids, which are absorbed from the colon to the bloodstream and provide little, but calculable, energy to the host. Reactions of the component sugars and extent of degradation in the human colon are well-known in the fermentation literature. 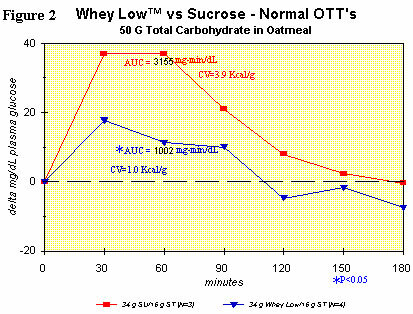 Figure 2 shows the same comparison as in Figure 1, but with the inclusion of oatmeal in each test article (i.e., sucrose + oatmeal vs. Whey Low® + oatmeal). The purpose of the study was to see if there was any interaction between Whey Low® and the starch in oatmeal. AUC was significantly lower for the Whey Low® meal vs. the sucrose meal, by 68%. Clearly, there was interference from the component sugars of Whey Low® with normal absorption of oat starch in the small intestine. 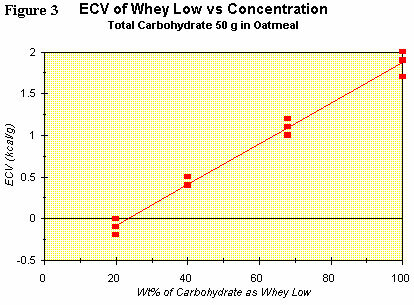 The ECV for Whey Low® in this case was 1.0 kcal/g. In other words, there was a reduction in caloric value of Whey Low® by nearly 50% because of its interaction with starch, which is normally present in the adult diet (~1 gram starch per gram of sugar, on average) whenever Whey Low® is consumed. No gastrointestinal effects were observed. A recent clinical study (N = 12 tests) showing the linear relation (R2 = 0.985) between concentration of Whey Low® as a percentage of total carbohydrate (ex fiber) and the ECV for the sweetener was completed. The results are shown graphically in Figure 3. The ECV ranges from nearly zero at 20 wt% of total carbohydrate to less than 2 kcal/g at 100% of total carbohydrate. Clearly, the interaction between Whey Low® and starch is such that a fraction of the starch is not absorbed in the small intestine. The consequence of this reduced absorption is a reduced caloric value for the added sweetener. More studies are underway and planned to determine the breadth of application of this phenomenon to a wider population and to a variety of meals. In the meantime, VivaLac® will claim the most conservative caloric value for Whey Low® in the human diet, i.e., no more than 1 kcal/g. Figure 4 shows the OTT for Whey Low® D vs. sugar in a typical type 2 diabetic subject. Comparison of the curves shows lower delta plasma glucose levels than with sucrose in the subject ingesting Whey Low® at 30 (75% reduction), 45 (76% reduction), 60 (66% reduction), and 120 minutes (146% reduction) after dosing. 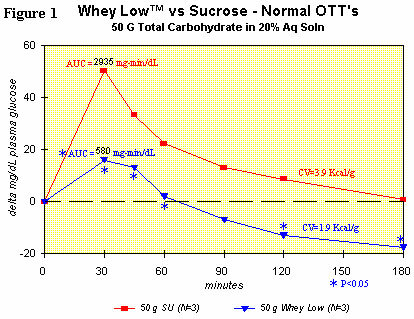 AUC was significantly lower by 82% for Whey Low® than for sucrose. The glycemic index (GI) for Whey Low® D is 12 (GI of glucose = 100) and is likely less than 12 in the presence of starch. No gastrointestinal effects were observed. This modified blend of Whey Low® shows the most promise as a sweetener that can help diabetics manage postprandial hyperglycemia and the all-important glycosylated hemoglobin. In conclusion, VivaLac® Inc. has developed a new technology that (1) shows great promise in helping modern man or woman control caloric utilization from the majority of his or her normal diet that is carbohydrates, without any sensorial sacrifice, (2) aids in the control of hyperglycemia with its long-term consequences of kidney damage, blindness, heart disease, and amputations and (3) yields safe, clinically-tested products with such apparent health benefits that VivaLac® Inc. has decided to make several of the resulting products available for sale immediately.